Although a springlike warm-up has moved in for the mid-week, it is still April after all. April is the second snowiest month for us. Those snows are typically separated by brief warming periods, like we are experiencing currently. We are tracking and carefully watching the next system on the "horizon". This will move in by Sunday with cold air and moisture. Yes, the combination could favor snowfall or cold rain at the least. It doesn't appear that this next system will be all that different than what we've had this season. An open trough will swing overhead and an associated cold front will move through from the northwest. This setup isn't necessarily conducive for big snows, except in the northcentral mountains. Why carefully watch then, you ask? (Maybe you didn't ask, but I did). April systems can easily be over-producers than how they look on paper: there's more moisture to work with this time of year, tap in just the right amount of cold air for snow, add springtime atmospheric energy to produce snow banding and whalla. . . an overproducer, just like the April 2nd/3rd storm was. Does the cold front have colder than expected temperatures. Right now, the system is an open wave in deterministic and ensemble members as it moves over Colorado, we'll see if this changes. Overall we are under the influence of a very progressive/fast pattern. Without a blocking pattern to our east to slow down the system, the chance is slim that we will see a speed change. The NAO trends strongly positive -- that confirms the lack of blocking. The cold air potential will remain a big question mark I believe. Right now, CFS anomalies shift sharply colder than average following this system; however there isn't a lot of support in that from the teleconnections. For example, the AO doesn't give much reason to believe a long standing push of cold will develop and confirm what the CFS is trying to do. 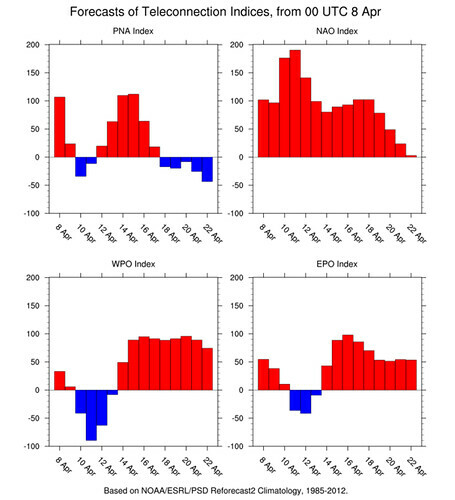 I'll keep an eye on the AO, WPO, and EPO for any changes in the trend. 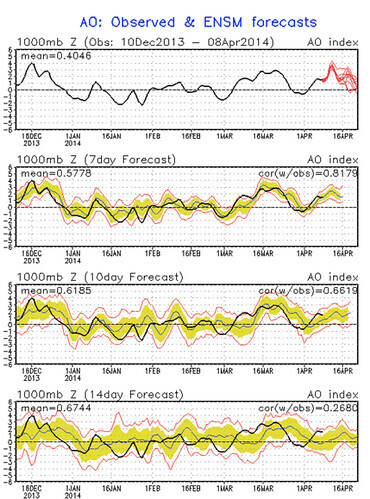 I'd also like to see the PNA trend more negative to support a digging system with colder air potential. Assuming there are no changes and the models/teleconnections are persistent, I see the Sunday system as just another for the season...some rain/snow and a brief shot of colder air (although a 30 to 40 degree drop for a day isn't much to scoff at). Stick with Weather5280 through the week for all the latest on this system as it continue to develop.